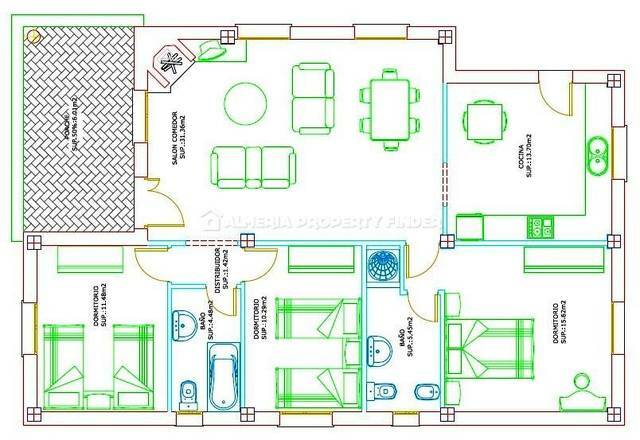 Nice spacious new villa of (148m2) on a fully enclosed plot of (2900m2). This spacious villa is located in a quiet area on a quite large plot and is located in Cantoria, the villa also has an upper floor. In the villa there is a spacious living room, 4 bedrooms, 2 bathrooms including 1 bathroom en-suite, also located in the villa a beautifully equipped kitchen, large terrace. The villa has the necessary space for permanent accommodation. On the upper floor you have to connect to the 2 bedrooms a beautiful separate terrace. On the plot there are several trees, the plot is closed with a fence. There is also enough space to place a swimming pool. The villa is quietly located and has the privacy necessary to sunbathe and enjoy. The villa is equipped with all amenities and is built with quality materials. The villa is 5 minutes from the village of Cantoria, where a lot of experience is to be found. Such as parties, a weekly market, cozy bars, shops, a medical center is available 24 o’clock at 24 o’clock. The villa is around 1h: 15 mins drive to Almeria Airport. The Garrucha coast is a 50min drive. If you wish to visit this beautiful property and have further questions please do not hesitate to contact us (immospanje). We provide you with the necessary advice and guidance.